This ACME ANVIL was created by Alloy Kats Studio and cast in solid bronze. It is intended to be enjoyed as an Objet d'PopArt and a symbol of unbridled determination which always has unexpected surprises happening along the way! Made in the USA. To purchase, see the ACME Anvil page. 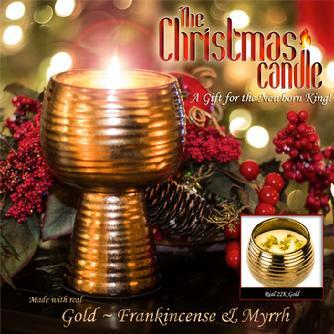 The Christmas Candle is a beautiful, high quality candle made with exotic aromatherapy essential oils of Frankincense and Myrrh. Its all natural soy wax is topped with sprinkles of pure 22K gold flakes. The ceramic candle holder has a metalized bronze glaze and measures about 6"x4". Looks elegant in any decor. To purchase, see The Christmas Candle page.